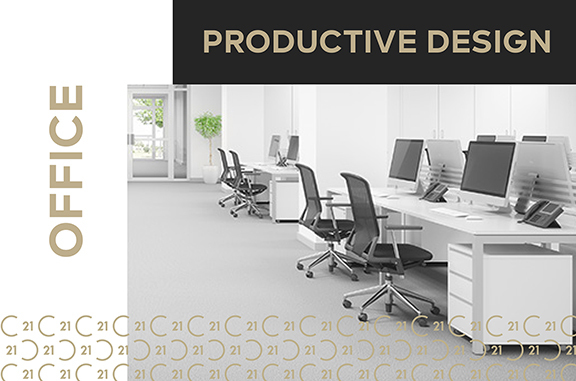 Whether you are starting from scratch or making improvements to your current office, we’ve got some great tips on how to design a productive workspace. If you work from home, you’ll want to make sure your office is distinctly separate from your day-to-day living. This will help you stay more organized and will help transition you from “home mode” to “work mode.” Once you designate this spot, stick with it. Think about what sort of things distract you from your work and make sure to keep these things out of your immediate work space. This could be a tv, a window, or even food. You don’t have to have an entire room dedicated to working, but make sure your working space constantly redirects your attention back to your task. Increasing productivity in your office starts with the right tools. This could mean everything from a comfortable chair to a computer. When budgeting, focus on the things you truly need for productivity so that the space is as functional as possible. You can always add to it later. Even if your work is mostly computer based, you are sure to accumulate things like office supplies and tax forms. It’s important to have a clear space designated for them as a messy office can make it hard to concentrate. Messes are notorious for stressing you out and decreasing productivity in the work place. Lighting is important in a workspace both for ambiance and to ensure you can see what you are working on. Cool lights have been proven better than warm lights for clarity of mind and maintaining concentration. Whichever you use, make sure your main working area is well lit. It has been proven that desk plants and flowers improve attention rates and keep you focused on your work. It is thought that nature gives you a quick, non-immersive distraction to give your mind a break without completely distracting your attention. Staying on track requires smart organization of your day and visual cues of what needs to be done are helpful to keep you on schedule. Whether you use an app, dry erase board or day planner, keep it visible. You will be less likely to miss anything and have a clear visual of how your day will progress. Being too hot or too cold can be a distraction so you’ll want to keep the temperature in your office comfortable. If you don’t have complete control over the temperature of the room, using a space heater, fan or dressing in layers can help.